The fruit therapy is a natural therapy that advocates the consumption of fruits and vegetables to improve the health of our body. The fruit therapy is a natural therapy that uses the therapeutic properties of the fruit and vegetables. This therapy is named after Dr. Ronald Albert Morales who wrote a series of books devoted to the therapeutic powers of fruits and vegetables, which became “bestseller” worldwide. Vitamins, minerals, antioxidants, enzymes and many other nutrients are in the interior of fruits and vegetables. The fruit therapy intends to use its property for the benefit of human health. Despite the many benefits it offers, we must be careful to consume fruit. Fruits contain a lot of sugar, once ingested, enters the bloodstream and de-compensation glucose levels if not consumed in moderation. To consume correctly without involving any risk to the organization must know its properties and follow patterns of consumption. The fruit therapy offers many advantages to our health since fruits are rich in vitamins, antioxidants, minerals, trace minerals and phytochemicals. Studies have shown a high correlation between low disease incidence and high consumption of fruit. Strengthen the defenses of our body and detoxify. Its high fiber content helps keep the bowel clean and preventing diseases such as colon cancer. They are cleansing. Thanks to its high water content help eliminate toxins. Favor the elimination of uric acid. Improve intestinal transit, with your input fiber, preventing constipation. Prevent the development of cancer. Improve the function of the liver and kidneys. When and how to eat fruit? 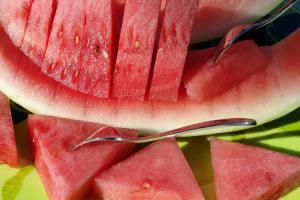 As we have seen, the fruit has countless health benefits, provided they take the right way. From small have accustomed us to see the fruit as a dessert, as something that we should always take after eating anything, but is it right? No. The fruit, when swallowed, they have a long process of digestion in the stomach but rapidly (approximately 30 min. ), Pass into the small intestine where it is just the body can decompose and absorb all the nutrients. It is for this rapid digestion so we should not combine fruit with other foods. The fruit should be taken on an empty stomach. When combined with other foods, which should stay longer in the stomach digesting, the fruit he could pass directly into the intestine, but the other food we have eaten in the way. Meanwhile, when combined, all the food will rot, fermented and acidified. So what should we do? For starters, as we have said, we must take the fruit on an empty stomach. We can eat all the fruit you want whenever we’ve digested our previous meal (2-3 hours) and not eat anything else until we have digested the fruit (30-45 min.). Another consideration when taking fruit, is that it should be fresh and raw. If it is processed and / or cooked fruit, our body is not able to get any benefits and only gives an energy expenditure during digestion. The use of fruits for medicinal or therapeutic purposes is not new; Hippocrates, in ancient Greece, said “Let your food be your medicine” and since Granada used the juice for its great antioxidant powers. Even with this, the term fruit therapy was not known until, in 1998, Ronald Albert published his book: fruit therapy , 105 fruits that give life. Morales’s book became sales leader. In the book are sorted fruits nutrients and devising an inventory of recipes for the treatment of diseases.